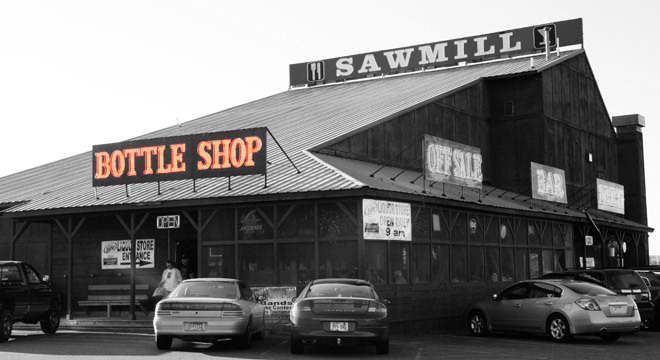 In 1970 the owner of the original Sawmill had a vision of building a landmark bar and grill constructed of rough cut lumber from local sawmills. In 1970 this idea, "The Sawmill", was complete and the largest bar/restaurant/liquor store north of Hinckley opened its doors. The decor featured local artifacts, antiques, memorabilia and a player piano. A caboose from the "DM&IR" railroad was attached for dining. The Sawmill thrived until it was totally destroyed by fire in 1989. In 1992 the new Sawmill, with a unique new design was opened. The original owner, Andy, at 70 years of age, had completed his vision again. An Iron Range Tradition was restored featuring much of the same decor. In 1997 Jay Ryan Enterprises, took over ownership and proudly operated the facility for 10 years until January 2008 when the new owner Alissa Sundberg of Sundberg Enterprises, LLC purchased the long standing landmark. Alissa and her staff will continue to carry on the legacy. The Walgreens store sits on the site of the "original" Sawmill.